The global vanilla and vanillin market reached 2,580 Tons and 37,286 Tons respectively in 2018. Vanilla represents among the world’s most popular spices and an important ingredient in products ranging from chocolate to perfume. It also acts as an effective antimicrobial and has been shown to protect the body against bacteria, mold and yeast. For these reasons, vanilla represents an important ingredient in herbicides to prevent against disease ridden crops. It also acts as an antimutagenic agent and reduces the rate of mutations in cells. Vanilla also contains properties that enable the body to inhibit angiogenesis which is the process of formation of new blood vessels. Vanillin is an aromatic compound extracted from vanilla pods after the harvest, fermentation, and curing process. The food and beverage industry currently represent the largest consumer of this market with vanillin representing one of the most common flavors used in a majority of food and beverages. This market is currently being driven by a number of factors. The growing demand for frozen desserts and bakery products represents a key factor catalyzing this market. Moreover, vanillin has a strong ability to enhance the flavor in food products and has properties such as low-calorie content and high availability of antioxidants. This is also expected to drive its demand in the food and beverage industry. Some of the other major factors driving the demand of vanilla and vanillin are increasing disposable incomes, rising demand of processed foods, growing applications in the pharmaceutical and cosmetics industry, etc. 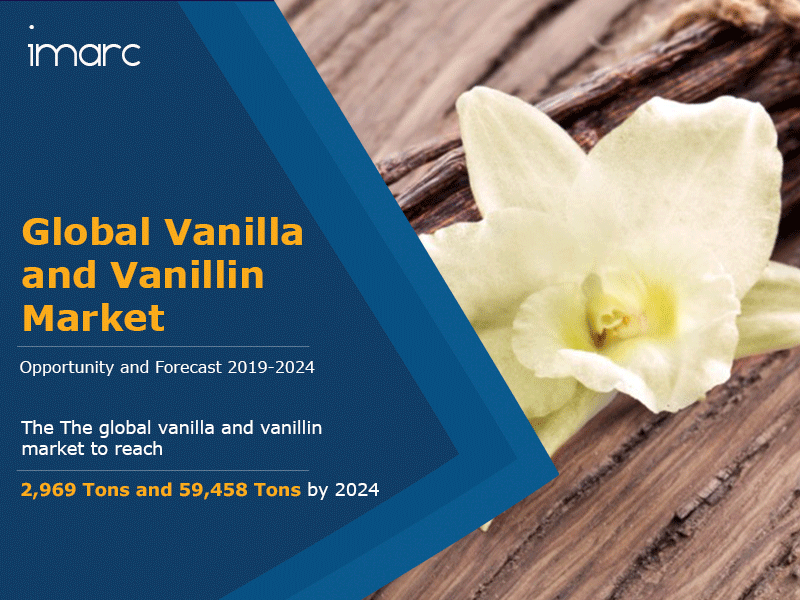 Catalyzed by these factors, the market for vanilla and vanillin is further projected to reach 2,969 Tons and 59,458 Tons by 2024, growing at a CAGR of around 2% and 8% respectively during 2019-2024. On the basis of product type, the vanilla beans market has been segmented as Madagascar Bourbon, Mexican Vanilla, Indonesian Vanilla, Tahitian Vanilla and Others. Madagascar Vanilla currently accounts for the largest share. Based on product type, the vanillin market has been segmented into Natural Vanillin and Synthetic Vanillin. Synthetic Vanillin currently dominates this market. Synthetic Vanillin has been further segmented into Lignin Vanillin, Guaiacol Vanillin and Ethyl Vanillin. Guaiacol Vanillin currently represents the biggest segment. On the basis of application, the vanilla and vanillin market have been segmented into food and beverages, cosmetics, pharmaceuticals and others. Among these, the food and beverages segment dominates both the vanilla and vanillin market. On the basis of raw materials, the vanillin market has been segmented into beans, lignin, guaiacol and others (rice bran, clove oil, pine bark, etc.). Among these, guaiacol accounts for the majority of the market share. Based on the end-use, the report finds that extract currently represents the largest end-use segment of vanillin. It is followed by powder and paste. Region-wise, the vanilla market has been segmented into Madagascar, Indonesia, Mexico and Papua New Guinea, where Madagascar represents the biggest producer of vanilla. Madagascar is followed by Indonesia, Mexico, Papua New Guinea and Others. On a geographical front, the vanillin market has been segmented into Europe, North America, South and Central America and Middle East and Africa (MEA). Asia-Pacific currently represents the biggest producer of vanillin, followed by Europe, North America, South and Central America and MEA. Jiaxing Zhonghua Chemical Co., Ltd.
How has the global vanilla and vanillin market performed so far and how will they perform in the coming years? What are the key regions in the global vanilla and vanillin market? Which are the popular product types in the global vanilla and vanillin market? What are the key application segments in the global vanilla and vanillin market? What are the major end-use sectors in the global vanilla and vanillin market? What are the price trends of vanilla and vanillin? What are the various stages in the value chain of the vanilla and vanillin market? What are the key driving factors and challenges in the global vanilla and vanillin market? What are the import and export trends of vanilla and vanillin? What is the structure of the global vanilla and vanillin market and who are the key players? What is the degree of competition in the global vanilla and vanillin market? 11.3.5 Jiaxing Zhonghua Chemical Co., Ltd.